Indian two-wheeler giant, Hero MotoCorp has officially tied-up with Erik Buell Racing of USA who have previously been partners to Harley Davidson and have developed many technologies for them. 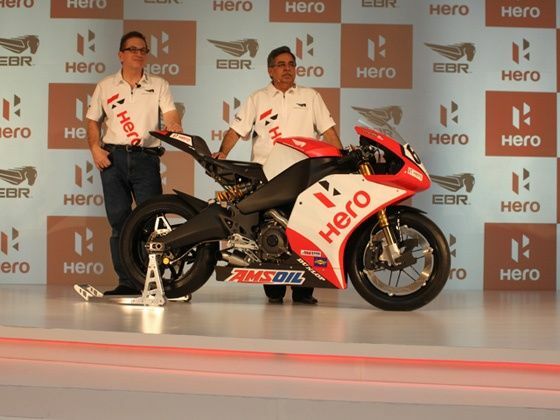 The strategic tie-up with Hero means that the Indian company will have access to EBR’s design and technological know-how specially in the big superbike segment, where Hero doesn’t have any major offering of its own. The development is a part of the Indian firm's strategy to enhance technological prowess, post the break up of the erstwhile partner, Honda. According to Pawan Munjal, MD & CEO, Hero MotoCorp, "This tie-up is in keeping with my objective of quickly scaling up our own in-house R&D capabilities to a global two-wheeler technology power-house by leveraging a network of strategic international alliances." The company also announced that it would debut Team Hero racing at the AMA pro racing superbike championships in the US on EBR 1190RS bikes. Showcasing an example of the EBR 1190RS (which develops over 170bhp) at the event Munjal also added that the first product from this tie-up would arrive by early 2013. And though it would not be a 1000 or 1200cc bike, it would be a big sporty bike aimed at the youth and would feature first of its kind features and technology. So we can say that Hero is now ready for fight with Bajaj and Yamaha in Indian market .